Approximately one year ago, a spectacular dive into Saturn ended NASA's Cassini mission—and with it a unique, 13-year research expedition to the Saturnian system. In the mission's last five months, the probe entered uncharted territory again: Twenty-two times, it plunged into the almost unexplored region between the planet Saturn and its innermost ring, the D ring. On Friday, 5 October 2018, the journal Science is releasing six articles describing first results from this mission phase. In one of these papers, a research team led by the Max Planck Institute for Solar System Research in Germany and the Applied Physics Laboratory of Johns Hopkins University in the U.S. reports on the unique proton radiation belts formed in close proximity to the planet. Due to presence of the dense A, B, and C rings, this area is almost completely decoupled from the main radiation belt and the rest of the magnetosphere, which extend farther outward. When the space probe Cassini swung into its first orbit around Saturn and its rings on July 1, 2004, the Magnetospheric Imaging Instrument (MIMI) particle detector suite, including Low Energy Magnetospheric Measurement System (LEMMS), developed and built under the leadership of MPS, caught a brief glimpse of the region between the planet and the innermost D ring. The measurements indicated that a population of charged particles may be present, but its exact composition and properties remained obscure. In the following years, MIMI-LEMMS investigated the particles that are trapped by Saturn's strong magnetic field outside its rings, forming its main radiation belt that consists of high-energy protons and electrons. The proton radiation belt extends more than 285,000 kilometers into space and is strongly influenced by Saturn's numerous moons, which segment it into five sectors. 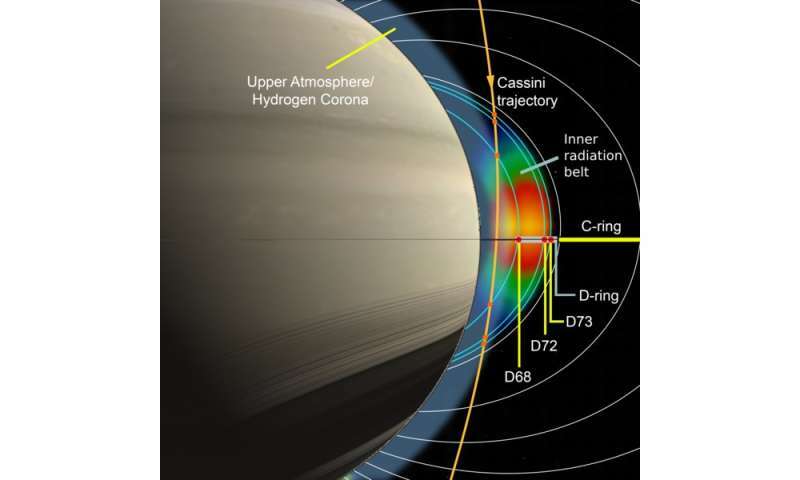 "Only 13 years later, shortly before the end of the mission, we were given the opportunity to follow up on our very first measurements at Saturn and see if an additional radiation belt sector co-exists with the D ring and the upper atmosphere of the planet," explains Elias Roussos, scientist at the Max Planck Institute for Solar Systems lead author of the current study. The 13-year-long test of patience has now paid off. In their current Science article, the scientists paint a comprehensive picture of the protons surrounding Saturn in close proximity. Two articles in the journal Geophysical Research Letters elaborate these findings. Similar to the main proton belt of Saturn, the protons that populate the region close to the planet are generated by incident galactic cosmic radiation. When cosmic radiation interacts with material in Saturn's atmosphere or in its dense rings, it triggers a chain of reactions generating high-energy protons that are subsequently trapped by the planet's magnetic field. Saturn's magnetic field is more than 10 times stronger near the planet than it is in the main radiation belts. That makes trapping so efficient that protons can remain for years in the same magnetic field line. That forces them to interact continuously with the D ring and the Saturnian atmosphere and gradually lose their full energy. But with the densities of the tenuous D ring unknown, it was unclear how fast this energy loss develops and whether a radiation belt could be maintained. Theoretical modeling indicated that one viable scenario might be MIMI measuring nothing but noise. That fortunately did not happen – at least for protons. 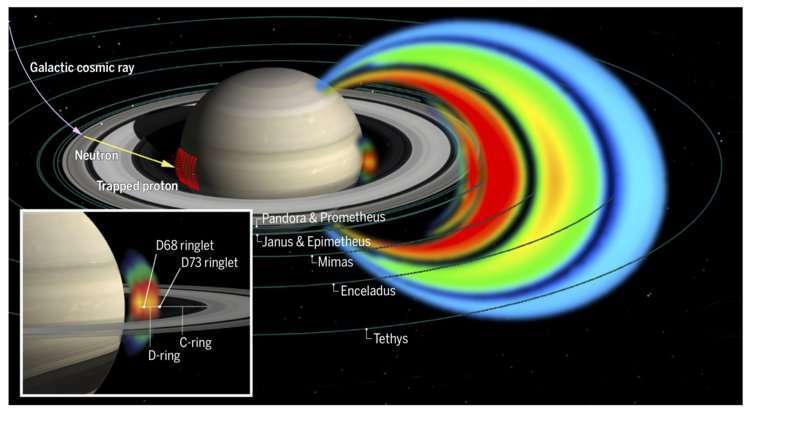 LEMMS measurements revealed a stable accumulation of energetic protons that extends from the atmosphere of Saturn and all across the D ring. The energy that many of these protons have is extreme: more than 10 times higher than what LEMMS was designed to measure. "We had to dig out old mechanical drawings of the instrument and construct new models of it to understand how it would measure in such an extreme environment," Roussos adds. "Outward of the D ring, Saturn's A, B and C rings are significantly denser and dustier, forming an effective 62,000-kilometer barrier for the trapping of charged particles," Roussos continues. That meant that the outer edge of the D ring was as far as this new proton belt could extend – and LEMMS measurements confirmed that. "This creates a radiation belt that is completely isolated from the rest of the magnetosphere," says MPS scientist Dr. Norbert Krupp, Principal Investigator of the MIMI-LEMMS team and co-author of the study in Science. This region is unique in the solar system. It offers the possibility to examine a radiation belt in laboratory-like conditions, as its protons are created by a very stable process, guided and controlled by Saturn's strong magnetic field. In Saturn's main radiation belt and in the radiation belts of Earth and Jupiter, these conditions are different—and much more complicated. At Earth, for example, a variable influx of high-energy particles from the sun can have a strong influence on the radiation belt structure. Equally valuable is the new information that LEMMS adds about the D ring system, which is too faint to study by imaging alone. This ring contains a total of three narrow ringlets, all brighter than the rest of the ring and named as D68, D72 and D73. While the intensity of protons was reduced by ringlets D68 and D73, ringlet D72 lying between them does not appear to have an effect. "Even though the D72 and D68 ringlets are similarly bright, LEMMS measurements show us that they must actually be very different," says Roussos. MIMI measurements also revealed a secondary, lower-energy proton radiation belt at an altitude below several thousand kilometers. This belt forms occasionally when fast neutral hydrogen atoms created in Saturn's magnetosphere get trapped near the planet when they impact its atmosphere and become charged. "The presence of this lower-altitude belt shows that some minimal information by Saturn's variable, distant magnetosphere can be transmitted across the planet's dense rings," Krupp adds. In the 13 years the MIMI/LEMMS instrument spent at Saturn, it conducted one of the most comprehensive investigations of a planetary radiation belt other than that of the Earth and even helped to discover unknown rings. A summary of these and further discoveries can be found in the book Saturn in the 21st Century, which is published by Cambridge University Press this month. Dr. Norbert Krupp from the MPS is among its four editors. This must be an embarrassment to the Electric Universe loonies. Seriously, Cusco? Are you denying that electric currents exist in the Universe? Why not try holding a metal fork and stick the tines into a live electrical outlet and see what happens. Science tells us that there are filaments in the Cosmos that connect galaxies. What do you think those filaments consist of? Spaghetti? Electric universe is one of the alternatives being considered by scientists. I think that's being a bit optimistic. The article you've referenced still assumes that the magnetic nature of the 'black hole' caused the filament in one way or another. No, it is not since there are no peer reviewed publications. The unordered set of 'ideas' does not work. It is considered pseudoscience. "Electric Universe (EU)[note 1] is an umbrella term that covers various pseudo-scientific cosmological ideas ... often vary from one delusional crank to the next." [ https://rationalw...Universe ]. This little movie demonstrates the charged nature of the rings. A moonlet approaching a ring is attracted towards it, then a discharge occurs causing the video drop-out, the ring dust is sputtered onto the moonlet, the charge equalises and the moonlet is repulsed and will head back towards another ring with a different charge level where the process will be repeated, so the moonlet will grow over time.